As a way to manage their document workflow, KB Admins have a choice. They may choose to allow their Authors to readily edit Active documents and have the opportunity to communicate with authors and leave comments (default setting). 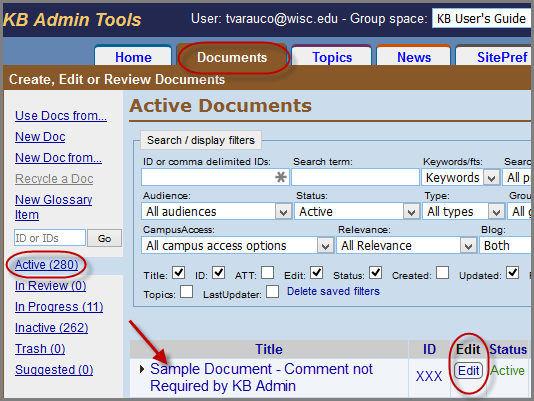 Another option for KB groups with multiple authors is to require Authors to make a descriptive comment, send a comment directly to the author, or leave a communique before updating a document. This document will review this latter method of requiring comments prior to editing a document. 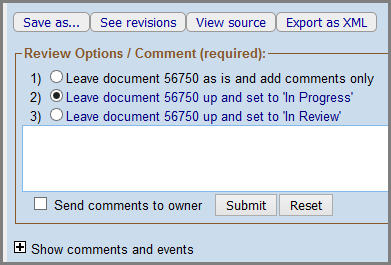 is to include an extra step of requiring a comment before allowing Authors to edit Active documents. KB Admins, please follow the steps in this document to achieve this setting, 8956 . Clicking on the Title of the document in the Active queue will lead to the and a number of buttons. To review the descriptions of these buttons, please see KB User's Guide - Documents Tab - Review Mode Button Descriptions . 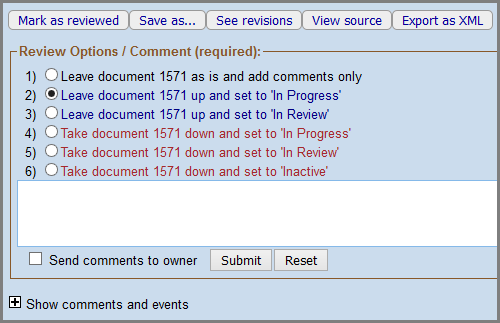 Document Review Mode buttons seen by those with and without Publish rights when in the Active queue. The image below shows the buttons available: Mark as reviewed, Save as, See revisions, View source and Export to XML. Authors with Publish rights will see the following Review Options at the bottom of the Active document they would like to Edit. The Author may select one of the options, enter a comment in the text field, and finally, click on the Submit button and proceed with editing. The image below of our sample document, 1571, lists six Review Options radio buttons plus the Send comments to owner checkbox. Authors without Publish rights will see the following Review Options at the bottom of the Active document. From here, the Author may select one of the options, enter a comment in the text field, and finally, click on the Submit button to proceed with editing. The image below of our sample document, 56750, lists three Review Options plus the Send comments to owner checkbox. will see a redirect message. The image below is the redirect message from the 1571 test document. You will be led to the Review Options/ Comment (required) radio buttons. You will see three buttons or six, depending on your Publish rights.